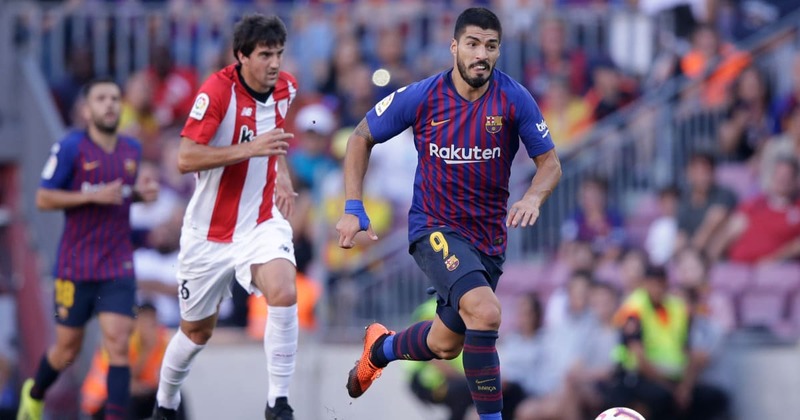 ?Athletic Bilbao host Barcelona in a La Liga clash at San Mames Stadium on Sunday in which the champions will look to get back to winning ways in their bid to retain their domestic crown. Ernesto Valverde’s side were held to a 2-2 draw by Valencia last time out in the league before coming from a goal down to draw in the first leg of their Copa del Rey semi final clash with arch rivals Real Madrid in midweek. Meanwhile, Bilbao will also be looking to bounce back after suffering a 2-1 defeat away to Real Sociedad last weekend, with Gaizka Garitano’s side 12th in the table and enduring a lukewarm campaign. ?Barca remain clear at the top of the table with a six-point cushion between them and ?Atletico Madrid in second place, though the Catalans will be keen to maintain a comfortable lead with three points on Sunday. When Is Kick Off?? Sunday 10 February? Athletic Bilbao will be without veteran forward Aritz Aduriz as the 37-year-old continues to recover from a knee problem. Right back Inigo Lekue and midfielder Mikel Rico are also absent, with both nursing long-term ankle injuries ahead of Sunday’s game. Meanwhile, Barcelona are facing significant defensive issues ahead of their trip to the Basque country, with star centre back Samuel Umtiti remaining on the sideline with a knee problem, whilst left back Jordi Alba is suspended for the La Liga clash. Ernesto Valverde is also enduring a shortage of midfield options at his disposal, with Brazilian duo Arthur and ?Rafinha both absent with a hamstring injury and a cruciate ligament rupture respectively. Back-up goalkeeper Jasper Cillessen is also out. Lionel Messi also didn’t train on Friday and may miss out, despite coming off the bench during the Copa del Rey draw with Real Madrid. ?Athletic Bilbao Herrerin; Marcos, Alvarez, Martinez, Yuri; D. Garcia, San Jose; R. Garcia, Muniain, Cordoba; Williams?. ?Barcelona ?Ter Stegen; Semedo, Pique, Lenglet, Roberto; Rakitic, Busquets, Vidal; Dembele, Suarez, Coutinho. The previous meeting between the two sides ended in a 1-1 draw at Camp Nou in September, as a late Munir El Haddadi strike cancelled out Oscar de Marcos’ opener and spared the champions’ blushes earlier in the season. The two sides first met 98 years ago in the 1920 Copa del Rey final, in which Barcelona lifted the cup with a 2-0 victory. Barcelona have a dominant record of 114 wins from the 224 previous games between the two sides, though Bilbao boast the biggest margin of victory in any previous meetings – a 12-1 win over the Catalans in 1931. ?Messi is the fixture’s all-time top scorer, with a total of 24 goals from his previous games against Sunday’s opposition. Athletic Bilbao’s recent form has largely summed up what has been a season of mixed fortunes for the Basque side. A triple header of games against Sevilla saw Gaizka Garitano’s team eliminated from the Copa del Rey round of 16 by Los Hispalenses after losing 3-2 on aggregate, despite winning the second leg 0-1. A 2-0 win over Pablo Machin’s side in La Liga was sandwiched between the two legs. Bilbao have since drawn to Villarreal, beaten Real Betis and lost to Real Sociedad in their last three outings and will be hoping to restore greater consistency in the coming weeks. Meanwhile, Barcelona were the defeated Bilbao’s conquerors in the cup with a 6-3 aggregate win over Sevilla in the quarter-final of the Copa del Rey, with Ernesto Valverde’s side overturning a 2-0 deficit from the first leg of the tie. That second leg win was, though, Barca’s only win in their last three outings, having drawn their two games since then against Valencia and ?Real Madrid in La Liga and the first leg of a Clasico Copa del Rey semi final tie respectively. Both sides will look to return to winning ways on Sunday, but with the title race at stake and little more room for error for the champions at the top of the table, Barcelona’s need for the three points is the greater of the two. Ernesto Valverde’s ranks are beginning to be stretched by injuries, but the Barca head coach should have enough quality and firepower at his disposal to overcome his former side in what is likely to be a tough away clash in the Basque Country.